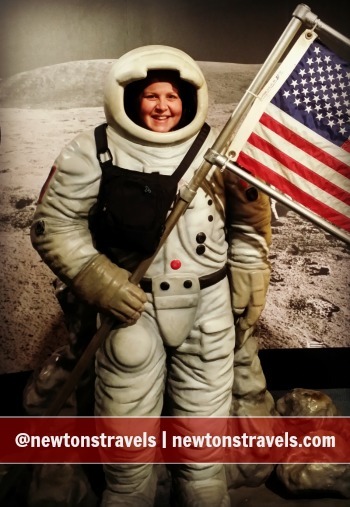 The Travelon React bag has even been to the Science & Industry Museum in Chicago, IL. I was sent the Travelon React bag from the company to take on our travels and feature here on the blog. This bag has been all over…to Roatan, Honduras, downtown Chicago and more places, even while running errands. Travelon Bags is an industry leader of travel products and accessories. These anti theft bags are so cool. Have you ever heard of RFID blocking technology? If you aren’t familiar with what RFID is, it’s radio-frequency identification and is the wireless use of electromagnetic fields to transfer data. Credit cards & passports have chips in them so they can be scanned by readers at stores and the airport. Anyone that has access to a RFID tag reader can walk by you and scan your purse/bag easily to gain access to your credit card and other info. With these Travelon bags you don’t have to worry about those hackers getting access to your personal info. That is where these bags really come in handy. I definitely recommend that you have at least one of these amazing bags in your collection. Check out the video below to learn more about Travelon bags. The Anti-Theft small crossbody React bag has a front compartment organizer with RFID blocking card and passport slots. It also has a mesh expansion pocket that holds a regular size water bottle. The water bottle compartment was useful while we were touring the island of Roatan, Honduras. I was able to keep my phone and my favorite PowerGen external battery pack (this looks almost exactly like mine but is a different brand) in the back zippered pouch. The back zippered section could also hold an iPad mini. Side note: It doesn’t look like the PowerGen battery pack is available any longer but here are two similar ones. These look like they weigh much less than what I have so that is a bonus. These would even fit nicely in the front section of the TravelOn bag I have! These TravelOn bags are made of slash-proof construction and the shoulder strap is adjustable and cut-proof. The strap even attaches to a post or chair which is perfect for when you are working long hours at a local coffee shop. I received the Crossbody React black bag but they also have colors in light aqua, berry and stone. And I have my eye set on their Urban Tour bag and the midnight blue TravelOn messenger bag. These make the perfect travel companion so don’t leave home without one. Currently the Travelon React bag is $60.00. The size of this particular bag is 9 x 9.75 x 2. There are various types of anti-theft Travelon bags, messenger bags, wheeled carry on’s (see below, I must have one), toiletries and more on their website. I would definitely buy one of these bags in the future. They would make great gifts too! I am usually one to carry a big purse and once I started carrying this bag, I found it to be much more comfortable to take on the road. I actually like that is crosses over the body so it’s perfect when it comes to safety. 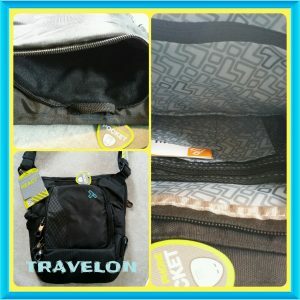 Have you tried any bags from Travelon? What do you think about the RFID blocking system?